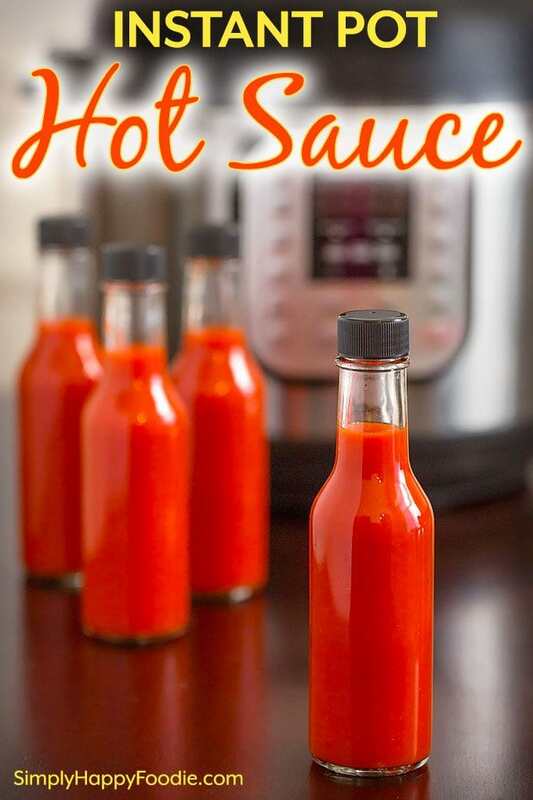 Instant Pot Hot Sauce is fast and so fun to make! Grab your favorite chile peppers and a few other simple ingredients. You can control the flavor and heat, and it tastes great! 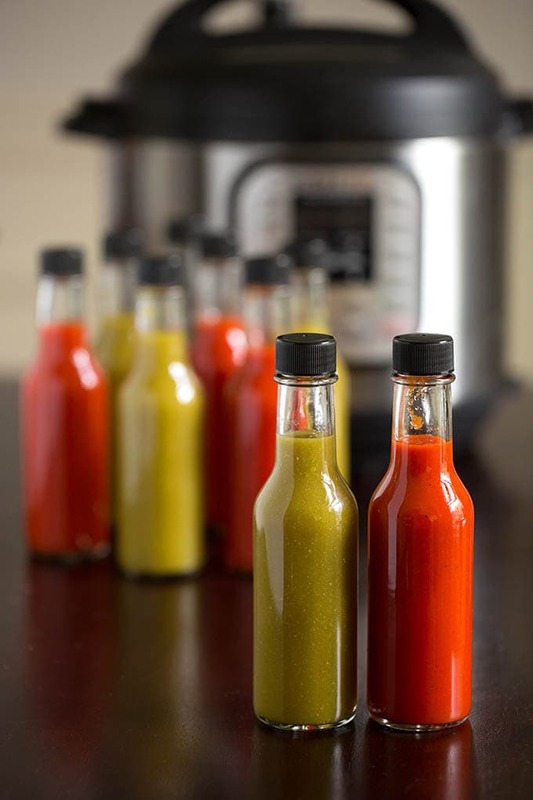 Pressure cooker hot sauce makes awesome gifts, too! Paul and I did a mini “staycation” this week. We had projects around the house to do, and wanted to stay home for his time off. But it was not all work. 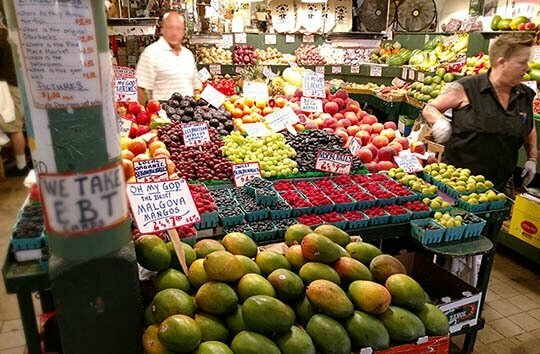 Today we went to the Pike Place Market in Seattle! We get down there a few times a year. Today I went with a purpose… Peppers! I knew I wanted to make a couple of batches of hot sauce to blog about, and the Market usually has great produce. Plus it’s fun to walk around and see everything. I found some lovely Fresno chiles, which are perfect for a nice red hot sauce (You can use any type of hot chile pepper!). There are so many hot sauce varieties out there, and we have several flavors we have picked up over time. I really like making my own though. The Instant Pot Hot Sauce is really fast to make! For me, the best part is not having to stand over the stove stirring and breathing in those capsaicin fumes! When I cook vegetables in my electric pressure cooker, depending on the type of veggie, I will only cook for 0 (yes, on the IP you can choose to cook for 0 minutes!) to 3 minutes, on the average. I like the 2 minute time for the chiles and carrots as that gets them very soft and releases all of the juices from them. Though I would normally use 1 full pound of the hot chile peppers, I wanted to also make a batch of fermented hot sauce, and that left me with 12 oz of each rather than a pound of each (I didn’t buy enough). So, this recipe is written for 12 oz, but feel free to use a full pound. You will need an extra hot sauce bottle or two. This Instant Pot Hot Sauce recipe is a little sweet, a touch smoky (I use alder smoked sea salt as a substitution for oak wood blocks), and HOT! I find myself reaching for it whenever I have eggs, tacos, refried beans, as it just goes with so many foods! Kicks them up a few notches! It’s really not that difficult to make Instant Pot Hot Sauce, and the results are delicious! It gets better within a couple of weeks, as aging helps develop the flavors. I keep it in the fridge for up to 3 months (maybe longer, but ours never lasts that long!). 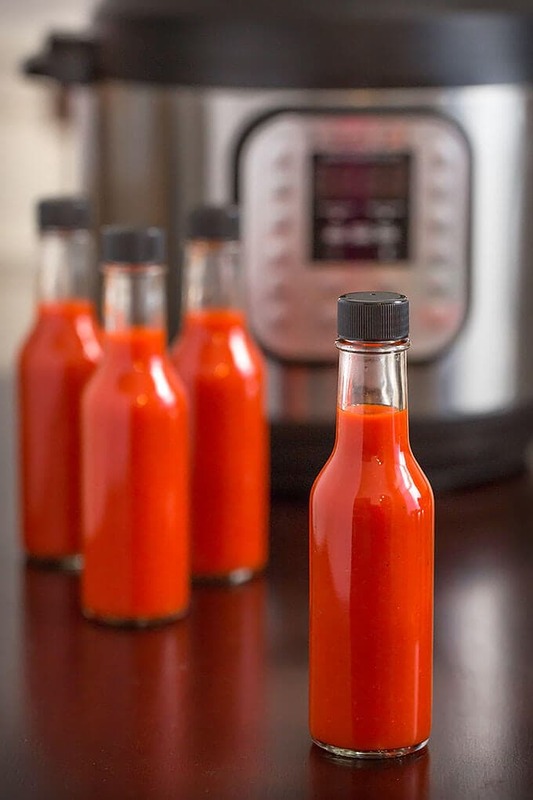 When you make homemade hot sauce, you will want to take simple precautions so you don’t burn your eyes or inhale those strong capsaicin fumes (basically anything with strong fumes I let naturally release, such as vanilla, as it has alcohol in it). Gloves (I have some food service gloves), eye protection (I just wear my reading glasses! ), natural release of the pressure, washing your knife handle (I made the mistake of not doing that once) and cutting board, etc. Please read the instructions in the recipe and heed my warning about safety! 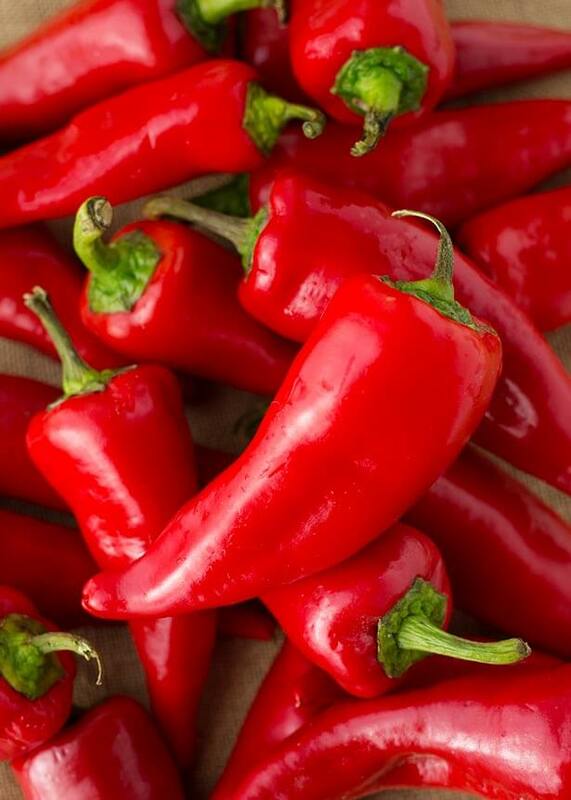 I hope I don’t make it sound scary, but if you have ever touched your eye after touching a hot pepper… Ouch! 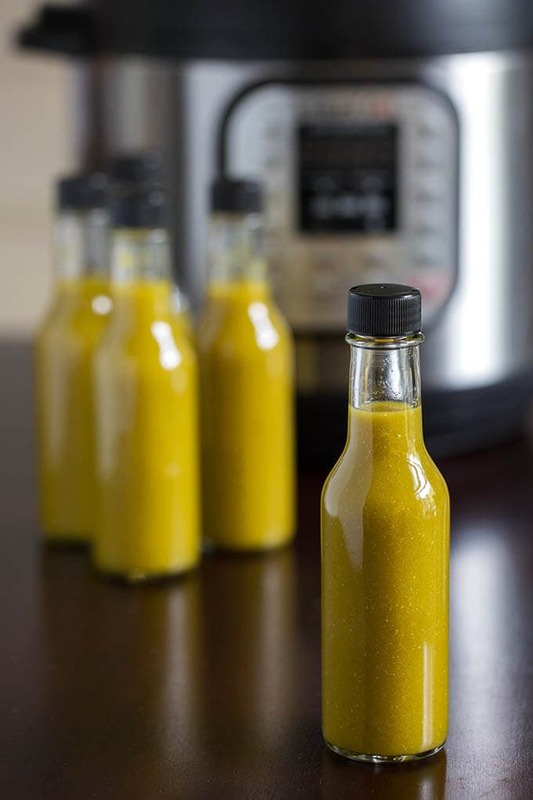 Instant Pot Hot Sauce is tasty and easy to make. 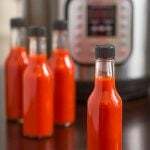 A versatile pressure cooker hot sauce recipe that you can make from any variety of chile pepper. Customize the ingredients to make it your own! Cut the tops off of the peppers and discard. Chop the peppers in thirds. Add to the stainless steel inner liner of the Instant Pot. Close the lid of the pressure cooker and set the steam release knob to the Sealing position. Press Manual (or Pressure Cook function, High Pressure) and use the + or - button to select 2 minutes. When cooking cycle ends, LET IT FULLY NATURALLY RELEASE PRESSURE. Do not do a Quick Release or manually release the pressure. 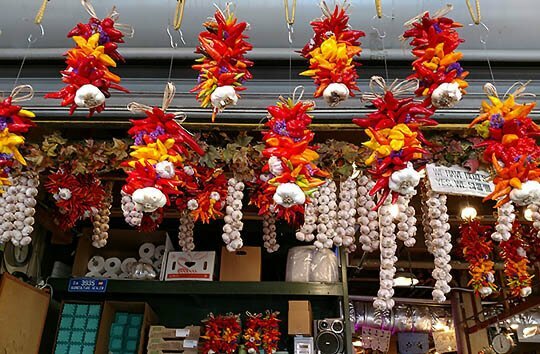 You don't want to inhale those pepper fumes! After all of the pressure is out of the pot, open the lid carefully, facing it away from your face. Don't breathe in the fumes! Let the mixture cool, then transfer it to a blender and blend until smooth. You can use an immersion blender (though I find the regular blender makes it smoother). Be very careful, and wear gloves and eye protection. Strain blended mixture through a strainer, and fill your hot sauce bottles! You could also leave unstrained and put in jars to enjoy a thicker hot sauce. The hot sauce gets better as it ages a bit. It will keep in the fridge for several weeks or more! 1) Wear gloves (I use food service gloves) and eye protection (I wear my reading glasses) when handling and chopping the peppers. 2) Clean your knife handle and cutting board well after chopping. 3) Let the pressure cooker naturally release the pressure, don't do it manually as you don't want the fumes in the air that you might breathe. I learned that the hard way from cooking it on the stove top. 4) Open the lid facing away from your face and do not inhale the steam/fumes as it wafts out of the pot! That would not be good. I like to make fermented hot sauce as well. I really like the flavor, and oak (like in wine making), gives the sauce a nice smoky taste. I have a batch in the pantry, fermenting away. This is a nice method to bring in more complex flavors. It just takes a lot longer. I will ferment it, then let it age for a year or more, and it will be ready for next Thanksgiving. Patience. Shout out to Hank Shaw (Hunter-Angler-Gardner-Cook), who breaks down a pretty decent fermented hot sauce recipe. Hank is my food idol! He reminds me of my Grandpa, who was a hunter and fisherman, and though Grandpa wasn’t the best cook, he could drink a cup of HOT coffee straight off of the campfire! Hank, if you ever see this, I’m a fan! This recipe is good for any hot peppers you like! I would like to make but I hate vinegar could I using anything else ? I don’t know of an alternative, though one may exist. You need the acid, so maybe lemon juice? Using apple cider vinegar is an option, if you like it any better. There are recipes that use red wine vinegar, and much less of it than in my recipe. The preparation is different, too. I think you will need to do some research. I think you CAN get away with less though, so that’s a good start! How long will this keep after preparation? I’d like to make and send for Christmas gifts. Does it require refrigeration? Just use either extra red bell pepper, or more hot pepper! Yes, increase the red bell pepper or the hot chile pepper! So you are saying these last 3 months refrigerated or unrefrigerated? Or so they last longer than that if I were to put them in my refrig ?? Thx. Three months refrigerated (just look out for any mold growth). 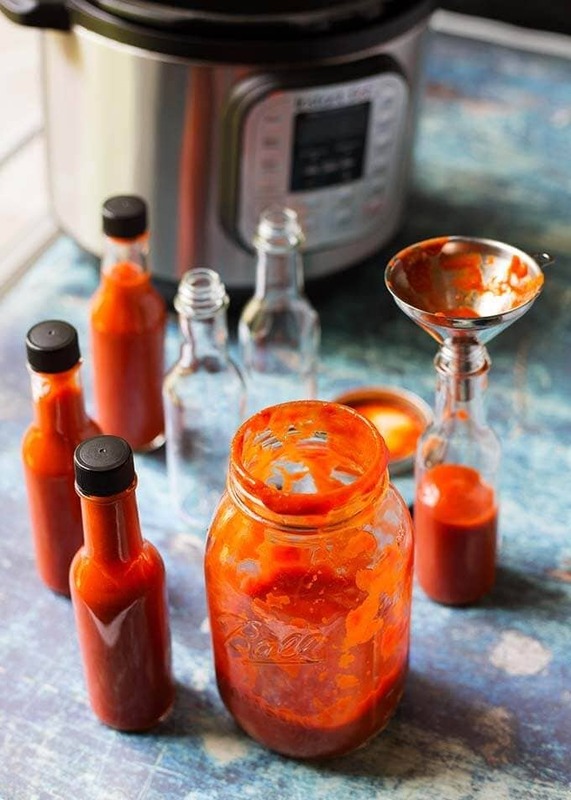 Fermented hot sauce can usually stay unrefrigerated (this recipe is not fermented). You get these jars off amazon ?? Lyle, there are different ways to ferment the chile peppers, and the new recipe I’m working on is a different one. If you subscribe to the newsletter, in the right hand side bar, (or scroll down if you are on a phone) you will get the update when the new recipe gets posted. I have a few batches fermenting now, in different ways. The results are not final with this new recipe yet! Stay tuned! I made the green pepper sauce recipe, but substituted roasted hatch chilies for the bell pepper, and added about 1/4 tsp. liquid smoke. It turned out over-the-top amazing!!! I’m SO happy to have an IP & Vitamix! Thank you SO much! I couldn’t be any more thrilled! Best hot sauce I’ve ever tasted!!! Hi Rochelle! I’m so glad you liked the hot sauce! I have loved using the hatch chiles, too! Roasting them was a great call, I bet that sauce is amazing!! Liquid smoke is a great substitution if you don’t have, or want to use, smoked salt or smoked paprika. Thank you for your review! P.S., I also love my Vitamix! 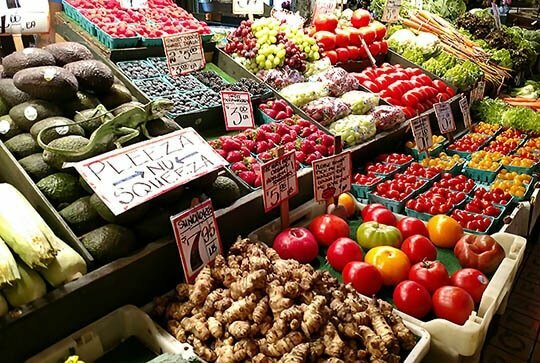 BTW, I’m right down in Olympia, and now really looking forward to shooting up to Pike’s Place on a pepper hunt! That’s great! 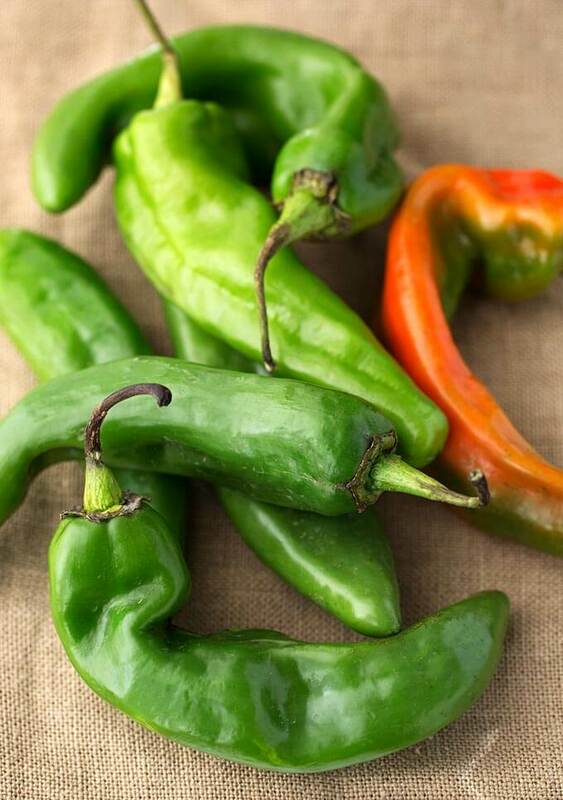 When it gets closer to summer, check out Fred Meyer for hatch chiles, too. I found some really good ones there! Hi Carrie, I’m still working on it. Stay tuned! Made the green version today and my husband, the hot sauce snob, has already used an entire bottle! It’s super, duper spicy but incredibly clean and flavorful on the palate. I don’t even like hot sauce and I’m digging this! Now I know what everybody is getting for Father’s Day… ? Hi Jerusha! I love that your hubby enjoyed this hot sauce so much! Sometimes I’ll leave out some of the seeds to “cool” it down a bit, but it’s good either way. And when the Hatch chiles come into season, the green sauce is even better with them added! It does make a great gift, too. I have been gifting it for Christmas and Father’s Day, like you! Thank you for your review, I appreciate it! Made this with various green peppers…jalapeño, Serrano, Anaheim and a roasted bell pepper. Very good. If I do this again, I wouldn’t use such a fine strainer. That gave me hard time. The sauce turned out more of a salsa rather than a hot sauce because the strained sauce was super thin. Either way, we had fun with it! I can’t wait to try your recipes for the red and the green! I have to wait, though; I’m growing the authentic “Tabasco” brand peppers to process, and I’m so excited to have this plant! It’s huge now, and has flowers on it, so I have a while to wait. Oh fun! I’m going to try growing them next year. This year I used up all of my garden with tomatoes! Have fun, and please let me know! I want to make this but do you think I could eliminate the garlic? My husband hates garlic, and I mean HATES it! Hi Colleen, yes, go ahead and omit the garlic. I don’t know what to add in place of it, but you can get creative! I made this twice as recipe presented except I used a variety of hot and mild peppers from my garden. I also added the suggested smoked paprika. Both batches turned out great. Most of it is presently in the freezer in small canning jars. Thanks so much for developing and sharing this recipe. That’s great, Sharon! Thank you for your review! I’ve now made this about 20 times. with many different peppers and seasonings! I give it away as gifts and receive rave reviews! I know that I commented before, but I just really want to thank you for giving me the courage to make hot sauce in my IP. It’s so good, I feel like I could get rich if I bottled it up and sold it! I’m way too lazy, but REALLY enjoyed this recipe! Thank you again! I love food! Girl! You are an expert now! I am so happy that you checked back in!